Anand Sharma sees significant potential for cooperation in areas such as infrastructure development, aviation, power generation, energy and information technology. The fourth India-Russia Business Dialogue was held within the framework of the St Petersburg International Economic Forum (SPIEF 2013) on June 21. The dialogue was co-chaired by Anand Sharma, India’s Minister of Commerce & Industry and Denis Manturov, Russia’s Minister of Industry & Trade and attended by many prominent Indian as well as Russian companies, the Indian Embassy of Moscow said. “Both ministers expressed satisfaction in the progress of our bilateral trade and economic relations,” an embassy said in a press note. A presentation on Delhi Mumbai Industrial Corridor was made, highlighting the opportunities available for Russian companies in the infrastructure sector. Stress was also placed on Russian companies availing of the vast opportunities available in infrastructure as well as in other identified areas, the Indian embassy said. Sharma in his address said there was significant potential for cooperation in areas such as infrastructure development, aviation, power generation, energy, information technology, bio and nano technologies, fertilizer, pharmaceuticals and chemicals. 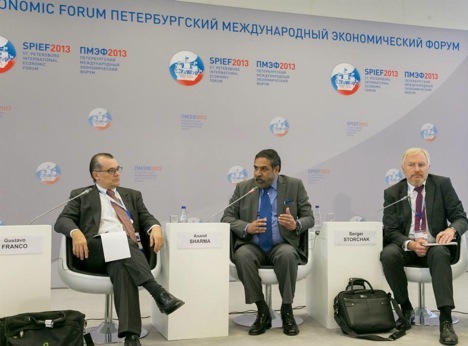 Sharma also participated in a panel discussion, in the framework of SPIEF 2013, “BRICS Partnership – The Potential and Limitations in Global Stewardship”. On the sidelines of SPIEF 2013, Sharma also met Viktor Khristenko, Chairman, Eurasian Economic Commission, and discussed the issue of a Comprehensive Economic Cooperation Agreement (CECA) between India and the Customs Union of Belarus, Kazakhstan and the Russian Federation. In April, Khristenko initiated talks with India on a CECA. “We are moving towards creating a platform for discussing which specific document, for instance a free trade agreement, could be conducive to the prospect of further developing relations between India and the Customs Union,” Khristenko said after the talks in Delhi. Ever since the idea of a CECA between India and the Customs Union first came into being in December 2011 after summit-level talks between then President Dmitry Medvedev and Prime Minister Manmohan Singh in Moscow, the negotiations over it have been moving at a slow pace. India and Russia have a strategic target of pushing their annual trade turnover to $20 billion by 2015. Bilateral trade in 2012 stood at around $11 billion.